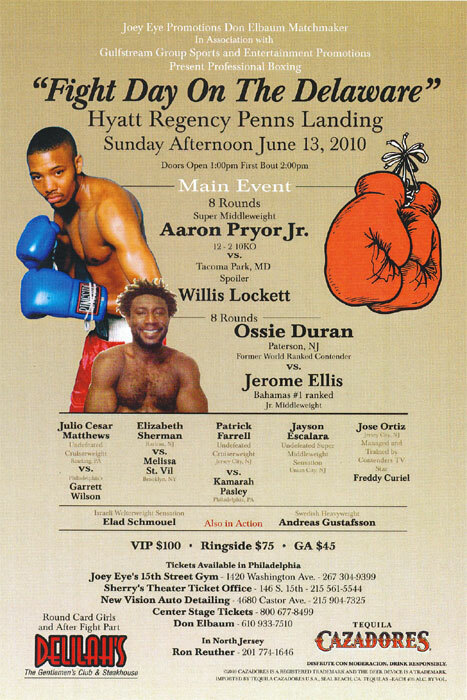 Forty-year-old cruiserweight Julio Cesar Matthews turned back the free-swinging challenge of Garrett Wilson on a rare Sunday afternoon boxing show yesterday (06/13/10). In one of the most attractive pairings of local preliminary fighters, the undefeated Matthews extended his streak to 10-0 (5 KO) against hard hitting and spirited Wilson. Garrett came off the floor in round one and created some uncomfortable moments for Matthews later on in the fight. He battled back strongly but Matthews used better boxing skills to ultimately come out on top. All three judges favored Matthews by scores of 58-55, 57-56 & 57-56. Wilson's record dropped to 7-5, after this his third straight loss. In the main event, Cincinnati's Aaron Pryor Jr. stopped Willis Lockett in the sixth round of their scheduled eight rounder. The result of the fight never seemed in doubt as Pryor cruised to victory. After round six of the scheduled eight rounder, referee Benjy Esteves Jr. halted the bout after conferring with Lockett's corner. Pryor, the son of former world champion Aaron Pryor, improved to 14-2. It was his eleventh knockout. Lockett fell to 12-9-5. Local cruiserweight Kamarah Pasley (4-4) pulled a big upset with his four round unanimous decision over the previously undefeated Patrick Farrell of Jersey City. The loss made Farrell 5-1. Visiting Swedish heavyweight Andres Gustafsson won his second straight bout in Philadelphia with a TKO2 over Pedro Martinez. The stoppage came at 1:05 of the second and raised Gustafsson's record to 5-0 with 3 KOs. Martinez lost for the third time in his eight bouts.